Area: 1,284,634 sq. km. (496,000 sq. mi. ); about twice the size of Texas. Cities: Capital: N'Djamena (pop. 828,000; 2010 estimate). Other major cities — Moundou, Abeche, Sarh, Bongor, Faya. Terrain: Desert, mountainous north; large arid central plain; fertile lowlands in southern regions. Climate: Northern desert: very dry throughout the year; central plain — hot and dry, with intense rainy season mid-June to mid-September; southern lowlands — warm and more humid with intense rainy seasons from late May to early October. Nationality: Noun and adjective — Chadian(s). 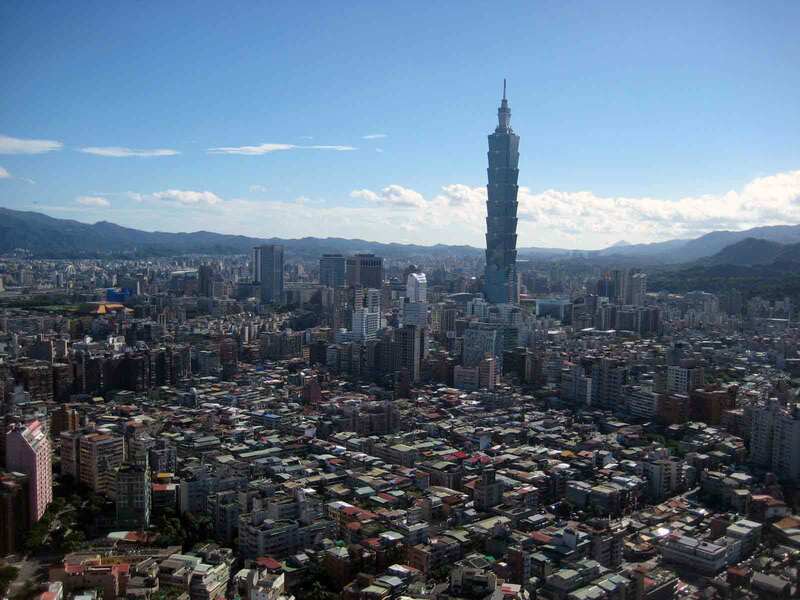 Population (2009 census): 11.2 million. Annual population growth rate (2010 est. ): 2.6%. Density (2010 est. ): 8.9 people per sq. km. Ethnic groups: 200 distinct groups. In the north and center, Gorane (sub-groups are Toubou, Daza, Kreda), Zaghawa, Kanembou, Ouaddai, Arabs, Baguirmi, Hadjerai, Fulbe, Kotoko, Hausa, Boulala, and Maba, most of whom are Muslim. In the south, Sara (including major subgroups — Ngambaye, Mbaye, Goulaye), Moudang, Moussei, and Massa, most of whom are Christian or animist. Approximately 1,000 French citizens live in Chad. Religions: Muslim 55%, Christian 35%, animist 10%. Languages: French and Arabic (official); Sara (in the south), more than 120 indigenous Chadian languages and dialects. Education: Years compulsory: 6. Enrollment — primary school 89.7% (2009 gross enrollment ratio — GER); secondary school 24.1% (2009 GER); higher education 2% (2009 GER). Literacy (age 15 and over can read and write French or Arabic, 2009 est.) — 33.6%. Health: Life expectancy (2009 est. ): 49.6 years. Infant mortality rate (2010 est.) — 99 deaths/1,000 live births. Work force (2009 est. ): 4.283 million. Agriculture — more than 80%; largely subsistence agriculture and stock raising. Access to communications (2009 estimate, World Bank): 0.1% have regular access to landline phones, 24% have regular access to cell phones, and 1.7% have access to the Internet. Independence: August 11, 1960 (from France). Branches: Executive — president (head of state), prime minister, Council of State. Legislative — National Assembly (unicameral). Judicial — Supreme Court; Court of Appeals; criminal courts; magistrate courts. Political parties: The Patriotic Salvation Movement (MPS) is dominant. Nearly 30 other parties also won seats in 2011 legislative elections. National holiday: Independence Day, August 11. GDP, current prices (2010 est. ): $8.6 billion. GDP per capita income (2010 est. ): $837. Population living below national poverty line (2008 est. ): 55%. Natural resources: Petroleum, natron (sodium carbonate), kaolin, gold, bauxite, tin, tungsten, titanium, iron ore.
Agriculture (2008, 13.6% of GDP): Products — sugar, cotton, gum arabic, livestock, fish, peanuts, millet, sorghum, rice, sweet potatoes, cassava, dates, manioc. Arable land (2007) — 38%. Industry (2008, 48.8% of GDP): Types: meatpacking, beer brewing, soap, cigarettes, construction materials, natron mining, soft-drink bottling. Services (2008): 37.5% of GDP. Trade: Exports: U.S. $2.9 billion (2009 est., nominal): petroleum products (nearly 96% of exports), cotton, livestock, gum arabic. Major markets — United States, Nigeria, France, Cameroon, Portugal, Germany, Thailand, Costa Rica, South Africa. Imports — U.S. $4.8 billion (2009 est., nominal): petroleum products, machinery and transportation equipment, foodstuffs, industrial goods, textiles. Major suppliers (2004) — U.S., France, Cameroon, Nigeria. Central government budget (2010): Revenues — U.S. $2.06 billion. Expenditures — U.S. $2.4 billion. 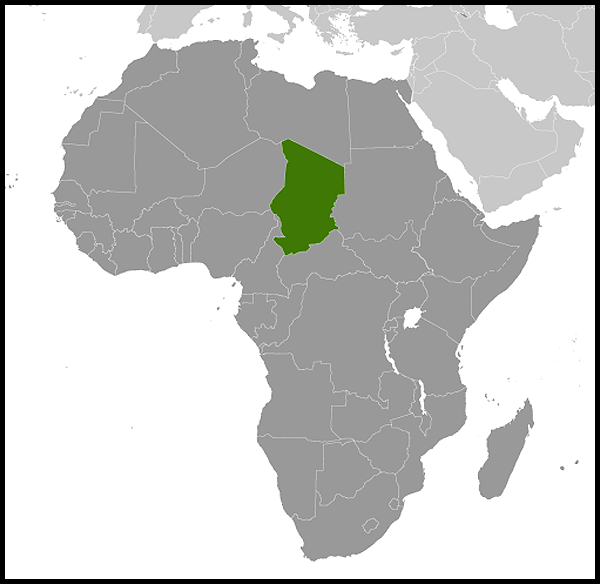 Chad is a landlocked country in north central Africa, with a territory twice the size of Texas. Population densities range from 54 persons per square kilometer in southern zones to 0.1 persons in the vast northern desert region, itself larger than France. The population of the capital city of N'Djamena, situated at the confluence of the Chari and Logone Rivers, is representative of Chad's ethnic and cultural diversity. Chad has four bioclimatic zones. The northernmost Saharan Desert zone averages less than 200 mm (8") of rainfall annually. The central Sahelian zone receives between 200 and 600 mm (24") of rainfall and has vegetation ranging from grass/shrub steppe to thorny, open savanna. The southern zone, often referred to as the Sudanian zone, receives between 600 and 1,000 mm (39"), with woodland savanna and deciduous forests for vegetation. Rainfall in the small Guinea zone, limited to Chad's southwestern tip, ranges between 1,000 and 1,200 mm (47"). The country's topography is generally flat, with the elevation gradually rising as one moves north and east away from Lake Chad. The highest point in Chad is Emi Koussi, a mountain that rises 3,100 meters (10,200 ft.) in the northern Tibesti Mountains. The Ennedi Plateau and the Ouaddai highlands in the east complete the image of a gradually sloping basin, which descends toward Lake Chad. There also are central highlands in the Guera region rising to 1,500 meters (4,900 ft.). Lake Chad, one of the most important wetlands on the continent and home to hundreds of species of fish and birds, shrank dramatically over 4 decades due to increased water use and inadequate rainfall. The lake, the second-largest in West Africa, covered 25,000 square kilometers in 1963 but had decreased to 1,350 square kilometers as of 2002. The Chari and Logone Rivers, both of which originate in the Central African Republic and flow northward, provide most of the water entering Lake Chad. There are more than 200 ethnic groups in Chad. Those in the north and center are generally Muslim; most southerners are Christians or animists. About 80% of the Chadian population is rural. There are over 250,000 refugees near the eastern border from the Sudanese conflict in Darfur; more than 60,000 Central African Republic refugees in the south; and approximately 130,000 internally displaced persons in eastern Chad. The region has been known to traders and geographers since the late Middle Ages. Since then, Chad has served as a crossroads for the Muslim peoples of the desert and sahelian regions, and the animist African tribes of the savanna regions to the south. While the former developed coherent political entities that became the powerful kingdoms of Kanem-Bornu, Baguirmi, and Ouaddai, controlling much of northern and central Chad as well as parts of Nigeria and Sudan, the southern regions were much less politically developed and remained splintered into small, local, tribal chiefdoms. Contact between the two regions was dominated by regular raids conducted by Muslims into the non-Muslim south to secure slaves for their own use and for trade into North Africa and the Middle East. The French first entered Chad in 1891, establishing their authority through military expeditions that reduced the politically backward south and by defeating the armies of the northern and central Muslim kingdoms, culminating in decisive victory over the powerful kingdom of Baguirmi in the battle of Kousseri (today in Cameroon). The French did not consider the territory pacified until 1911; armed clashes between French forces and local resistance fighters continued for years thereafter. France ruled southern Chad ("le Tchad Utile," or Useful Chad) as a typical colony with civil administration, basic education, urbanization of major centers, and missionary activity, while exploiting the region's agricultural potential. The French ruled northern and central Chad ("le Tchad des Sultans," or Chad of the Sultans) differently, confining the colonial footprint to a few military garrisons and relying on traditional tribal and religious leaders to administer the local populations in time-tried ways. The French made Chad, along with what are today Gabon, the Central African Republic, and the Republic of the Congo, part of a colonial federation called French Equatorial Africa, under a governor-general resident at Brazzaville in what is now the Republic of the Congo. In 1959, the territory of French Equatorial Africa was dissolved, and its four constituent states — Gabon, the Central African Republic, the Republic of the Congo, and Chad — became autonomous members of the French Community. In August 1960 Chad became an independent nation under its first president, Francois Tombalbaye, a southerner. Tombalbaye's authoritarianism and distrust of democracy led him in 1962 to ban all political parties except his own Chadian Progressive Party (PPT) and to attempt to concentrate all power in his own hands. His treatment of opponents, real or imagined, was extremely harsh, filling the prisons with thousands of political prisoners. His discrimination against the mostly Muslim central and northern regions and his attempt to impose his own ethnic group's customs on other tribes in Chad resulted in a tax revolt in 1965 that precipitated civil war with northern and central militants taking up arms to oust Tombalbaye and end the South's political dominance. Despite the help of French combat forces, the Tombalbaye government was never able to quell the insurgency. Tombalbaye's rule became more irrational and brutal, leading the military to carry out a coup in 1975, assassinating Tombalbaye and installing General Felix Malloum, another southerner, as head of state. In 1978, Malloum's government was broadened to include more northerners. Internal dissent within the government led the northern prime minister, Hissein Habre, to send his fighters against the national army in the capital in 1979, reigniting the civil war. Nigeria and the Organization of African Unity (OAU) attempted to bring the Chadian factions together. In August 1979, the Lagos accord established a transitional government pending national elections planned within 18 months. Goukouni Oueddei, a northerner, was named President; Colonel Kamougue, a southerner, Vice President; and Habre, Minister of Defense. Early in 1980, however, the accord broke down and fighting broke out again between Goukouni's and Habre's partisans. With assistance from Libya (which asserted a claim to the northern Chadian territory called the Aouzou Strip), Goukouni regained control of the capital and other urban centers and Habre retreated into Sudan. Goukouni's policy of political union of Chad and Libya, however, was unpopular and generated support for Habre, whose forces took N'Djamena in June 1981. He proclaimed himself President. French troops and an OAU peacekeeping force of 3,500 Nigerian, Senegalese, and Zairian troops remained neutral during the conflict. Habre continued to face armed opposition on various fronts and brutally repressed opposition to his rule. In 1983, Goukouni's forces launched an offensive against the Habre government's positions in northern and eastern Chad with Libyan military support. This provoked French and Zairian forces to intervene to support Habre, pushing Goukouni's and Libyan forces northward. In 1984, the French and Libyan Governments announced the mutual withdrawal of their forces from Chad. The French and Zairian troops withdrew, but Libyan forces backing Goukouni continued to occupy northern Chad. Habre defeated southern rebel groups and began a process of national reconciliation with former armed enemies and regime opponents. In 1986, Habre's forces, with French and U.S. financial and logistical support, attacked and decisively defeated the Libyans and Goukouni's forces in northern Chad in what was known as the Toyota War, from Habre's desert warriors' preference for using light trucks and desert-warfare tactics in overcoming the more numerous and better-armed and -equipped enemy. With Libyan forces expelled from nearly all of Chadian territory, a cease-fire was declared in 1987 and Chad and Libya restored normal relations in 1989. In 1994 the International Court of Justice confirmed Chadian sovereignty over the Aouzou Strip, effectively ending residual Libyan occupation of parts of Chad. Habre's increasingly authoritarian rule and perceived favoritism of his own Gorane ethnic group weakened the coalition of northern and central groups on which he depended for support. In 1989, Idriss Deby, one of Habre's leading generals and a Zaghawa, defected and fled to Darfur in Sudan, from which he mounted a Zaghawa-supported series of attacks on the Habre regime. In December 1990, with Libyan and Sudanese assistance, Deby's forces successfully marched on N'Djamena, causing Habre to flee the country. Deby's Patriotic Salvation Movement (MPS) approved a national charter on February 28, 1991, with Deby as president. During the 1990s and into the new century, Deby ruled in an authoritarian fashion, although proclaiming a desire for a democratic transition while surviving frequent coup and assassination attempts. He promulgated a new constitution in 1996, legalized political parties in 1992, and held an inclusive "National Conference" in 1993 aimed at political and electoral reform leading to a pluralist democratic regime. In 1996, Deby won the country's first multi-party presidential election, defeating General Kamougue. In 1997, Deby's MPS party won 63 of 125 seats in legislative elections. International observers noted numerous serious irregularities in both electoral events. In 2001, Deby won reelection in a flawed contest, gaining 63% of the votes. In 2002, the MPS was successful in similarly flawed legislative elections. In 2004, the National Assembly voted to amend the constitution to abolish presidential term limits; the amendment was approved in a 2005 national referendum. In 2006, Deby was elected to his third 5-year presidential term with 78% of the vote. As a result, opposition parties boycotted the 2006 National Assembly elections, precipitating a political crisis. The government responded by signing an agreement with the opposition coalition for a program of political and electoral reforms aimed at credible national legislative, municipal, and presidential elections, codified in an August 13, 2007 accord. The accord also extended the mandate of the 2002 Assembly until such time as the reforms were achieved and the elections held. Dissatisfaction with Deby's long rule among many ethnic groups, including subsets of Deby's own Zaghawa ethnic group, and tensions between Chad and Sudan caused by the Darfur crisis led in 2004 to the creation of a renewed and serious rebel threat: several newly-formed Chadian rebel groups found refuge in Sudan and support from the Sudanese Government, enabling them to mount frequent armed attacks into Chad, with the intention of violently toppling the Deby regime. Deby's situation was complicated by the influx of 300,000 Darfuri refugees into Chad and the displacement of 200,000 Chadians in eastern Chad. The Governments of Chad and Sudan soon became involved in a deadly proxy war, with the Government of Chad supporting Sudanese rebels committed to regime change in Khartoum and the Government of Sudan supporting Chadian rebels with the same goal vis-a-vis Chad. Sudanese rebels reached the Chadian capital twice, in 2006 and 2008, nearly overrunning the city in the latter instance, before being repulsed by government forces. In 2008-2009, after the Chadian Army had defeated three major rebel attacks, and the Sudanese Army repulsed a rebel attack that reached the suburbs of Khartoum, international pressure for the normalization of Chad-Sudan relations intensified. Several Chad-Sudan agreements brokered by third parties had failed from 2006 to 2008, following which N'Djamena and Khartoum moved to resolve their differences bilaterally. This resulted in January 2010 in a Chad-Sudan peace accord, according to which the sides agreed to end the proxy war by breaking with rebel clients, normalize relations, and secure their border through joint military cooperation. President Deby publicly renounced past support for Sudanese rebels, a key Sudanese and international demand, and committed Chad to assist international efforts to resolve the Darfur crisis through peaceful negotiation. The humanitarian effort to assist refugees and displaced persons in eastern Chad led to the deployment of two international peacekeeping operations, a European one from 2007-2008, and a UN one called MINURCAT, beginning in 2008. In 2010, the Government of Chad declined to agree to a renewal of MINURCAT's mandate, claiming that the project had been ineffective and proposing to provide better security with its own resources. MINURCAT ceased operations in December 2010. Chad provides security in and around refugee camps and to humanitarian personnel providing assistance through the Detachement Integre de Securite (DIS), a Chadian national police force created by the Chadian Government expressly for this purpose. The August 13, 2007 accord on political and electoral reforms continues to be implemented. The accord has been facilitated through technical and political support from the European Union (EU), the U.S., France, Germany, the African Union (AU), and Switzerland, and they and the UN actively support the electoral process. In February 2011, Chad held legislative elections. Approximately 56% of the electorate voted, and the election was conducted without major incidents or any violence. On February 27, Chad's electoral commission announced that the ruling MPS and its allies had won 133 of 188 National Assembly seats. Opposition leaders alleged that fraud and irregularities invalidated the elections, but Chad's Constitutional Court did not nullify the results. International observers noted the lack of election preparation and some irregularities, but did not consider the government to have engaged in fraud. Chad held presidential elections in April 2011. President Deby won easily, with approximately 88% of the vote, although turnout appeared low to international observers. Leading opposition figures boycotted the presidential elections due to concerns that deficiencies in the legislative elections had not been corrected. Municipal elections are scheduled for January 2012. The constitutional basis for the government is the 1996 constitution. A strong executive branch headed by the president dominates the Chadian political system. Chad is a unitary, centralized republic. The executive branch names all 22 governors, 61 prefects, and 252 sub-prefects, who have wide powers to administer the national territory. The president has the power to appoint the prime minister and the Council of State (or cabinet), as well as judges, military officers, provincial officials, and heads of Chad's parastatal firms. In cases of grave and immediate threat, the president, in consultation with the National Assembly President and Council of State, may declare a state of emergency. National Assembly deputies are elected by universal suffrage for 4-year terms. The Assembly holds regular sessions twice a year, and can hold special sessions when called for by the prime minister. Deputies elect a president of the National Assembly every 2 years. Assembly deputies or members of the executive branch may introduce legislation; once passed by the Assembly, the president must take action to either sign or reject the law within 15 days. The National Assembly must approve the prime minister's plan of government and may force the prime minister to resign through a majority vote of no confidence. However, if the National Assembly rejects the executive branch's program twice in 1 year, the president may disband the Assembly and call for new legislative elections. In practice, the president exercises considerable influence over the National Assembly through the MPS party structure. Despite the constitution's guarantee of judicial independence from the executive branch, the president names most key judicial officials. The Supreme Court is made up of a chief justice, named by the president, and 15 councilors chosen by the president and National Assembly; appointments are for life. The Constitutional Council, with nine judges elected to 9-year terms, has the power to review all legislation, treaties and international agreements prior to their adoption. The constitution recognizes customary and traditional law in locales where it is long-established and to the extent it does not interfere with public order or constitutional guarantees of equality for all citizens. The Republic of Chad maintains an embassy in the United States at 2401 Massachusetts Ave., NW, Washington, DC 20008 (tel: 202-652-1312; fax 202-758-0341). Chad's armed forces, l'Armee National du Tchad (ANT), is divided into its land forces and air forces. Its overall strength is approximately 25,000 soldiers. Much of the effective leadership is drawn from President Deby's Zaghawa ethnic group. The Chad Government is pursuing plans to reduce the ANT's personnel strength and professionalize the military. More than 80% of the work force is involved in agriculture — small-scale subsistence farming, herding, and fishing. Like other developing countries, Chad has a small formal sector and a large, thriving informal sector. In 2010, Chad's GDP was estimated at approximately $8.6 billion, distributed among agriculture, industry, and services. Chad is highly dependent on foreign assistance. Its principal donors include the European Union, France, and the multilateral lending agencies. Petroleum, cotton, cattle, and gum arabic are Chad's major exports. Since 2000, a consortium of three oil companies — U.S.-based Exxon Mobil and Chevron, joined by the Malaysian Petronas company — has been extracting oil from wells in the south of Chad and sending it to market via a pipeline from Chad through Cameroon to the Gulf of Guinea. The consortium has invested more than $7 billion in the Chad-Cameroon petroleum pipeline project, which originally had support from the World Bank in the form of Bank loans to Chad and Cameroon to enable them to participate in the project. In return, the Chad Government agreed to a set of unique mechanisms for World Bank, private sector, government, and civil society collaboration to guarantee that future oil revenues would benefit local populations and result in poverty alleviation. Economically, the project has been extremely successful, rewarding both the consortium and the Chad Government with profits well beyond those initially expected by either one. Chad's oil exports to the U.S. make it the sixth-leading African exporting country to the U.S. However, the poverty alleviation goals of the agreement were not met, due in part to Chad's emphasis on defense expenditures rather than on socio-economic development per the agreement. The agreement was renegotiated in 2006, but the Bank did not judge that Chad's performance under the second agreement was acceptable. Consequently, the Bank decided in 2008 to withdraw from the Chad petroleum sector and asked the Chad Government for early repayment of its loans. The Chad Government complied in 2009. The Bank and Chad continued to cooperate in sectors other than petroleum through 2010, when the World Bank sent a resident representative to Chad to broaden cooperation. Primary markets for Chadian non-petroleum exports include neighboring Cameroon and Nigeria and France, Germany, and Portugal. Cotton remains an important export. The national cotton company — CotonTchad — is planned for privatization. The parastatal has been poorly managed and cotton yields have been steadily declining over the past several years. The other major export is livestock — cattle, sheep, goats, and, camels — driven to market or skins shipped to market in neighboring countries, particularly Nigeria. Chad also sells smoked and dried fish to its neighbors and exports several million dollars worth of gum arabic to Europe and the United States each year. Other food crops include millet, sorghum, peanuts, rice, sweet potatoes, manioc, cassava, and yams. Chad's economic performance outside the oil sector continues to depend on fluctuations in rainfall and in prices of its principal export commodities, especially cotton. Public revenue management and corruption continue to plague Chad. The country reached a decision point in 2001 for Heavily Indebted Poor Countries (HIPC) debt relief and was receiving assistance from the International Monetary Fund (IMF) and World Bank. By 2002, however, the country needed an extension on the IMF Poverty Reduction and Growth Facility (PRGF) program's performance indicators. It continued to receive assistance from the international financial institutions but struggled to meet the program's financial targets, and the Fund ceased the program for non-performance. The IMF renewed Fund-managed programs with Chad in 2008 and 2009, but the country was unable to meet the targets and is not currently eligible to received IMF or HIPC assistance. Resident diplomatic missions in N'Djamena include the embassies of Algeria, Cameroon, Central African Republic, China, Republic of the Congo, Cote d'Ivoire, Democratic Republic of the Congo, Egypt, France, Germany, Nigeria, Russia, Sovereign Military Order of Malta, Saudi Arabia, South Africa, Sudan, the United States, the European Union, and the African Union. Switzerland maintains an aid mission. Turkey, Belgium, Togo, Senegal, Niger, South Korea, India, Italy, the United Kingdom, Denmark, Canada, and Benin have honorary consuls. Chad is a principal and active member of the African Union and the United Nations, as well as of the principal regional organizations, including the Sahelo-Saharian Organization (SEN-SAD), the Economic Community of Central African States (CEEAC), and the Economic and Monetary Union of Central African (CEMAC). Chad has been an active champion of regional sectoral cooperation through the Lake Chad and Niger River Basin Commissions and the Interstate Commission for the Fight Against the Drought in the Sahel (CILS). In addition to these organizations, Chad belongs to the Francophone Community (OIF); African, Caribbean and Pacific Group of States; African Development Bank; Central African States Development Bank, Central African Economic Commission for Livestock, Meat and Fishery Resources (CEBEVIRHA); Central African States Bank (BEAC); Economic Commission for Africa; G-77; Inter-African Conference for Insurance Markets; International Atomic Energy Agency (IAEA); International Civil Aviation Organization; International Confederation of Free Trade Unions; International Criminal Court; International Development Association; International Finance Corporation; International Fund for Agricultural Development; International Federation of the Red Cross and Red Crescent Societies; International Labor Organization; International Monetary Fund; Interpol; International Olympic Committee; International Red Cross and Red Crescent Movement; International Telecommunication Union; Non-Aligned Movement (NAM); Islamic Development Bank; Islamic Educational, Scientific and Cultural Organization; Organization for the Harmonization of Business Law in Africa (OHADA); Organization of Islamic Cooperation; Organization for the Prohibition of Chemical Weapons; Universal Postal Union; World Bank; World Confederation of Labor; World Health Organization; World Intellectual Property Organization; World Meteorological Organization; World Tourism Organization; World Trade Organization. Relations between the United States and Chad are good. The American embassy in N'Djamena was established at Chadian independence in 1960. U.S. interests in Chad include continued provision of humanitarian assistance to refugees and internally displaced persons in eastern Chad and Central African Republic refugees in southern Chad; continued Chadian commitment to efforts to reinforce regional stability and security, especially in regard to the Darfur crisis; continued Chadian progress toward a democratic transition, including promotion of human rights and the rule of law; more responsible public-revenue management to fuel sustainable socio-economic development; and continued U.S.-Chadian cooperation on regional and international counterterrorism efforts. There is no U.S. Agency for International Development mission or Peace Corps program in Chad. A number of American voluntary agencies operate in Chad. The U.S. Embassy (http://ndjamena.usembassy.gov/" title="http://ndjamena.usembassy.gov/) in Chad is located on Avenue Felix Eboue, N'Djamena, (tel: 235-22-51-70-09, 235-22-51-90-52, or 235-22-51-92-33; fax 235-22-51-56-54).